McCarthy-Kennecott, Alaska. How to get here. The Shushanna Guesthouse is located in the heart of "downtown" McCarthy, in the middle of Wrangell-St. Elias National Park. This is the jumping off point for all sorts of adventures in the largest wilderness area on earth. Whether you're coming for a day or two or looking for a comfortable place to start a multi-day wilderness excursion, we know you'll love your stay with us! Wrangell St Elias National Park is located in the Eastern region of South-central Alaska. The Chugach, Wrangell, and St. Elias mountain ranges converge here in what is often referred to as the “Mountain Kingdom of North America.” It is the largest national park in the United States, six times the size of Yellowstone. Wrangell St Elias encompasses over 20,000 square miles of mountain wilderness – that’s over 50,000 square kilometers, or 25% larger than Switzerland! 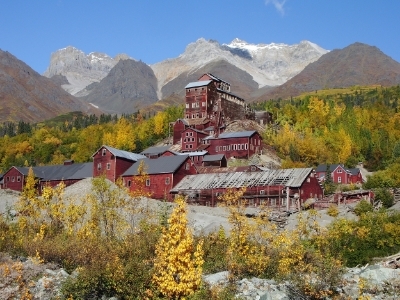 During this “copper boom”, the small town of Shushanna Junction began expanding to meet the growing needs of Kennecott. This small town eventually changed its name to McCarthy, and became the site of the railroad turnaround station. McCarthy was quite a miners’ and railroaders’ town, with all the – ahem – “entertainment” a young man on the frontier might require. Restaurants, pool halls, hotels, saloons, a dress shop, shoe shop, garage, hardware store, and thriving red light district all popped up to provide services to more than 800 people in the area. Our Guesthouse is located right in the middle of this historic boom-town and we know you'll love exploring the area while you stay with us! There are several options for getting to McCarthy-Kennecott. We are off the beaten path and it’s going to take you some time and effort but we promise it will be worth it! We have some of the most raw, majestic scenery you will find anywhere in the state, and without any crowds! You can drive your own car or rental 100 miles from the Richardson Highway to McCarthy. This makes sense for many folks who are traveling around the state and stopping for 1-4 days in Wrangell-St. Elias, as long as you don’t mind taking 2+ hours to drive the 60 miles of gravel down the McCarthy Road. Most rental car companies will not cover you to drive this road. We recommend Go North Rentals in Anchorage. Budget and Enterprise may also have some vehicles they will allow to drive the McCarthy Road – check with them for details. Wrangell Mountain Air offers three daily flights from Chitina, at the edge of the park. Chitina is a 5 hour drive from Anchorage, 2.5 hours from Valdez and about 6 hours from Fairbanks. You can leave your car parked at the airport there and avoid the gravel altogether. Wrangell Mountain Air also offers charter flights on whatever schedule works for you from Anchorage and other destinations within Alaska. We work very closely with them and highly recommend them for any bush flying needs. The Kennicott Shuttle offers daily van service from Glennallen to McCarthy in the morning and back in the late afternoon. Their site also has good information about connecting service to and from Anchorage and other destinations. Wrangell-St. Elias Tours has morning departures for direct van service between Anchorage, McCarthy and Valdez 5 days a week during the summer. Great option especially if you’re spending more than a few days in the area and don’t want to leave a rental vehicle sitting… They also offer a daily van service between Chitina/Kenny Lake and McCarthy at different times than the Kennicott Shuttle. Both morning and afternoon departures are available.